While we pride ourselves on being innovative in looking at new technologies and how to implement them, we also carry out the day to day electrical work while maintaining our high standards. 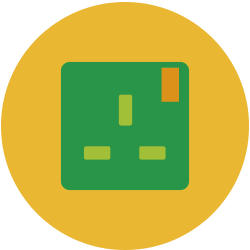 Our work is within the commercial and industrial sectors although we are always on hand to offer free advice to homeowners concerning electrical safety. As well as working to a specification, we also offer a full design service. We welcome the opportunity to be able to give our customers and potential clients a competitive price for their project. Our aim is to offer value engineering options without substituting the quality of the installation while still delivering the plan they want. Qudos Energy is members of the Philips Lighting Partner Programme, and this gives us access to Philips/Signify lighting products and solutions and means we will always have our finger on the pulse with new technologies and market-leading solutions. We have been hand selected due to expertise in delivering the new Interact brand of lighting which includes the PoE and wireless systems as well as the tried and tested Dynalite systems. We are now able to deliver turnkey lighting solutions to our customers old and new using trusted Philips products, we design, install and integrate technologies to offer a customised, seamless solution. Once the project is complete, we can provide ongoing support. Click the get in touch button below to contact Mark or Paul. Alternatively, call the office on +44(0)1482 880390 and Ruby will deal with your enquiry. 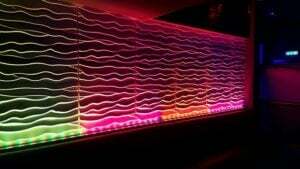 A very eye-catching nightclub installation in London, using a mixture of RGBW light battens along with digital LED systems. 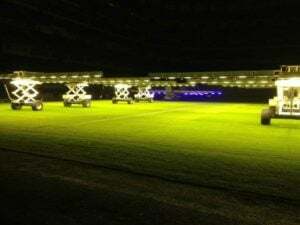 Real Madrid – A light rig converted from HPS to LED, trialed for 3 months with great results. We used our expertise to turn the Faraday Wing, Southbank University, into a smart building. 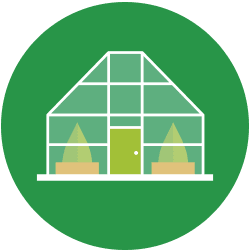 We became experts in glasshouse electrical systems when we first started working in Horticultural Installations in 2014. Since then we have provided innovative solutions in Glasshouses across the country. We pride ourselves on finding the best-tailored solution using the newest and top of the range technology. 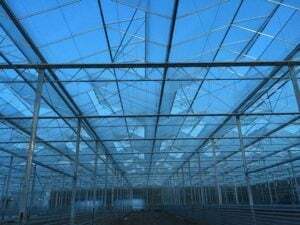 We have carried out full electrical installations in brand new glasshouses. One situated just outside Hawick, Scotland and most recently the Arium in Whinmoor. Whether you require vent limits to be set up, an EICR (Electrical Installation Condition Report) carrying out or a control panel design and build, we have the skills to deliver a first-class project on time and at a price that is competitive. 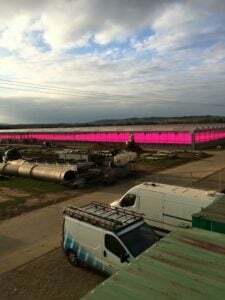 External picture of the massive glasshouse at APS Produce on the Isle of WIght. The lit area is 1 hectare. 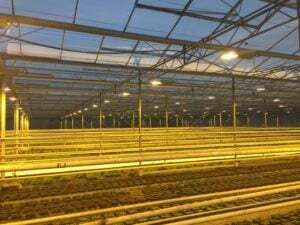 Inside the glasshouse at APS produce, it uses Phillips toplights and interlighting and was the first 100% operational LED lit glasshouse. Full installation, from control panel to lights, at Living Salads, East Yorkshire, of HPS lighting. 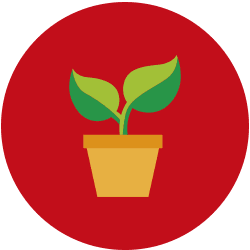 This is an alternative lighting solution for photosynthesis. A new glasshouse built at Frank Rudd & Son in Lancashire, showing the roof vents opening after they have been installed, wired and connected to the control panel. 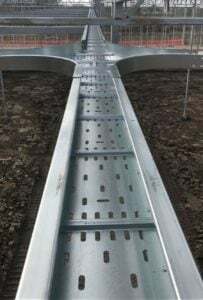 This is an installation we carried out as a subcontractor at Kernock Plants. 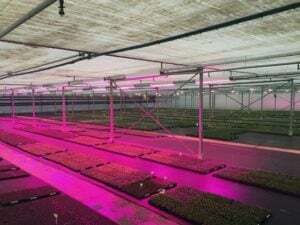 They use Philips top lights at different mol levels 30-50-75 for different species of young bedding plants. 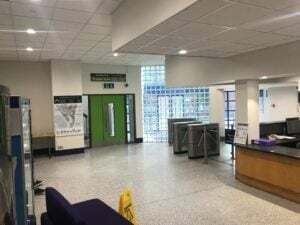 Arium – Leeds. Wiring containment we designed which is capable of spanning 6m gaps, giving adequate protection and wiring routes around the greenhouse. 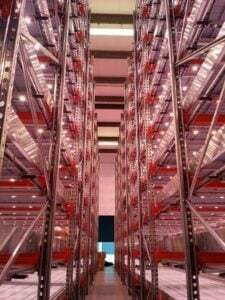 Vertical farming, also known as Urban Farming, is the process of having vertically stacked trays on a racking system, with the aim to grow fresh produce. This can be in any building, as long as the area itself is sealed from outside influences. The right balance of light and ventilation must also be achieved for the crop to be successful. Once this has been done correctly, all kinds of fresh produce can be farmed throughout the year. Supplying companies without the need for import in colder months. Why is it necessary to get the system just right? It is necessary to enable the environment to be controlled. For example, Temperature-Humidity and on top of this lighting and irrigation systems. The beauty of this method is once in a sterile area the chances of disease and contamination are minimal, and a recipe is developed so the plants can be produced to the same high standard again and again. Without the right system, to begin with, this is not possible. 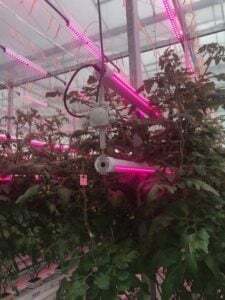 At Qudos we are always working within this area, looking at different technologies and control systems to further enhance the prospects of Urban Farming in the UK. Like Martin Luther we have a dream, a dream that the days of produce travelling 1000’s of miles to our supermarkets with reduced shelf life will end and the journey from harvest to store is achieved in 4 hours. 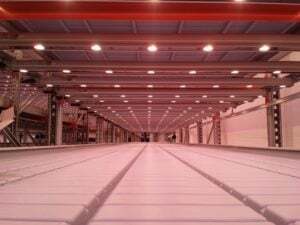 Philips lighting production modules were used in this facility as well as Priva Blue ID to control the environment. London’s first aquaponic urban farm; aquaponics combines aquaculture for fish farming and hydroponics for growing specialist sustainable salads. If you are looking to reduce your energy consumption, whether to save money or reduce the impact on the environment as part of your organisation’s corporate responsibility, you first need to understand what you are using and what assets are consuming the most electricity. Qudos can offer different levels of energy monitoring. 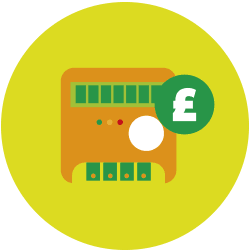 If you have a power issue we can deploy our power analyser to identify the problem, or you may want to supplement your existing fiscal metering by going more granular. From individual distribution boards to single circuits we have the tools and software to achieve this. We like to help you save money on your energy spend, and we can also detect problems before they arise. For example, when an AHU motor is going to fail, its current consumption will go up. Our software looks at the load, and when the current draw exceeds a level, it sends an alarm to the facilities team. This enables them to monitor it and exchange the motor at a convenient time to minimise downtime. Electric vehicles are becoming more common, plans are in place to make Britain the forefront of the design and manufacturing of zero-emission vehicles, and for all new cars and vans to be effectively zero emission by 2040. The Clean Van Commitment has been agreed by 16 of the UK’s largest fleet operators to have nearly 2,400 ZEV vans by 2020 and go completely zero emissions in cities by 2028. The need for EV Charging points is growing daily; new properties have the option of an EV Charging point. We are always looking for different ways to save the environment, let us help you do the same. Here at Qudos Energy, we can offer you the installation and testing of EV charge points in your workplace premises, with options for both overground and underground car parks. Our qualified electricians have passed the Electric Vehicle Charging Course (City & Guilds 2919-01) and are registered with an EV charge point main dealer, which means we can provide the work required. Grant funding is available through the Electric Vehicle Home charge Grant (EVHS) or Workplace Charging Grant (WCS). This will have to be authorised by OLEV (The Office for Low Emission Vehicles) before any charge points are installed. So, with Grant Funding, the costs are a lot lower. Call us today to book an appointment for a free site survey; upon confirmation of what your requirements are we will arrange the government grant. • The Electric Vehicle Home Charge Scheme (EVHS) provides grant funding of up to 75% towards the cost of installing electric vehicle charge points at domestic properties across the UK. Call us on 01482 880390 or email us, hello@qudosenergy.co.uk to find out more.